A security deposit of $250 is also required and will be authorized on your credit card 7 days prior to arrival. A charge may result for damage to the condo, missing contents or for exceeding the maximum number of allowed overnight guests. All stays have a checkout cleaning fee. Stays of more than 11 days have additional mandatory interim cleaning fees. For example, if you had reserved the condo for 28 days, there would be two interim cleanings during your stay. One around the 11th day and one around the 22nd day, as well as the checkout cleaning after you have checked out. There is a $25/hour charge for excessive cleaning, beyond standard checkout cleaning. We allow a maximum of two overnight guests in the condo. We charge a fee of $25 per beach towel missing upon checkout. Do not hang hangers on the fire sprinkler heads. It will cause them to go off and you will be charged a fee for activating the fire alarm and for the damage that the water causes to the unit. It is against the Ilikai Association of Apartment Owners rules to hang any towels or clothes on the lanai railings. Doing so may result in a fine, up to $100, which will be charged to your credit card. Please leave the lanai doors closed when you leave the condo. The birds have been known to come in if the doors are left open. Also the wind and rain can come in causing damage to the drapes and furnishings. Please help us save energy by using the ECONOMY setting on the air conditioner, using the fan only setting if you don't need cooled air, turning the AC off when you leave the condo or have the lanai doors open. There is an instruction sheet for the airconditioner in the cabinet under the T.V. SHOULD YOU NEED ASSISTANCE WHILE ON ISLAND PLEASE CONTACT please call or email Ryan or Kelly Hass at 808-589-7126 or 808 589-7885 or email them at 808hass@gmail.com. This is our 6th year staying in condo 1530 and we wouldn't stay any other place! The location is centrally located to everything in Wakiki, which is where we like to be. It is near restaurants, shopping centers, and the main Waikiki area. The condo is comfortable and has everything you need. It is the only condo we know that has a sliding divider between spaces, which is watching we need. It also has a great view of the ocean and it's fun to watch all the boats go by. Newly Remodeled in October 2014! Granite Kitchen counter with 4 bar stools. 36" table with 4 chairs on lanai. The surfboards above the kitchen bar are locked and are NOT to be used! Spacious Open kitchen with new (Oct. 2014) cabinets with large granite counter/workspace. New (Oct. 2014) Tile floor throughout. Hamilton Beach multi speed Blender. Dishware, Glassware and Silverware - service for 8. Extensive Kitchen Utensils, Knives & Gadgets, Bakeware, Serveware. Wireless High Speed Internet . Free local and long distance calling within the United States and Canada. Mirror Wall expanding the view of the ocean. Watch your 32" Flatscreen HD TV from bed. Sliding Shoji Panels to seperate the bedroom from the livingroom for privacy. Laundry facilities are located on each floor and to the right of the elevators. 2 washers and 2 dryers. $2.50 per load, quarters only. Laundry products vending machine: soap, bleach, and softener $1.25 each. Note: Garbage room is location to the left of the elevators. Trash must be bagged. Recycle bins are available for glass, aluminium, and newspaper. The unit overlooks Duke Kahanamoku Beach and Lagoon and The Hilton Hawaiian Village pools and garden walkways. Convenient and within walking distance to Hawaii Convention Center, Ala Moana Shopping Center, Walmart, Sam's Club, Don Quijote and Foodland, Ala Moana Beach Park, Magic lsland, downtown Waikiki and Waikiki Beach. The Ilikai Hotel offers valet and underground parking. Currently the rate is $28 for 24 hours with in and out privileges. The rates are subject to change so you can call 808-949-3811 to verify the price. There is a section of the parking lot that is free for beach goers. It is closed from 10:30 pm until 4:30 am and has a 6 hour maximum. There is metered parking along Hobron and Holomoana streets at $1 per hour. There is a public parking garage on Hobron Street above the Red Lobster Restaurant across the street from The Modern. Currently they charge $20 for 24 hours with in and out privileges. The rates are subject to change so call 808-973-0631 to verifly the price. Great condo!! Very comfortable with an amazing view. I would highly recommend this condo. Excellent location, beautiful view, would stay again! Excellent location. Quick access to the beach and lagoon. Hosts supplies you with everything you need for the beach. Hotel has car rentals, shops, restaurant and pool available on site. Would stay here again! We loved our stay at the Ilikai Hotel Condos. It was a studio condo on the 15th floor, The condo was fully equipped with everything we needed for our stay. It was nice to have access to beach chairs, snorkel equipment, beach towels, etc. The valet parking was expensive but very efficient. Glad we had a nice place to stay while we were in Waikiki. Our family of four, including two teens very much enjoyed our stay in condo 1530. Yes, it is tight for 4 people, but the condo is very clean and well furnished and worked well for us. The king bed is great, and the kids did not complain about the sofa bed. The view from the deck is lovely and we enjoyed dinner on the deck most evenings. We very much enjoyed the use of the snorkeling equipment, boogie boards and beach chairs. The kitchen is extremely well equipped, and even the knives were sharp. The Ilikai complex itself contains a small grocery and gift shop, an ice cream shop and Cinnamon's restaurant. There are two pools, one for sunbathing, and one for swimming. The swimming pool is large and relatively deep for a Waikiki pool. We would definitely recommend Condo 1530! 3 best friends week. Since one of us going through cancer treatments and a hip replacement the bus stop and trolley outside the entrance was key to our location. The condo exceeded my expectations. The view from the balcony was fabulous. The snorkeling gear, beach chairs,and beach towels provided were greatly appreciated. Everything we needed was available. Since I own my own cleaning business I notice a couple housekeeping issues but they were so minor compared to our fabulous stay. Thank you for taking the time to post a review for us for unit 1530 and your stay in 2018. We are so glad you found the condo to exceed your expectations! It is a great view and adds to the special experience. We wish however you would have called us about the minor cleaning issues as we would have liked to resolved them for you as well as know to make any corrections needed in the future. We do hope you can come back again soon! Nice Condo in a nice building with a great location! The tour for Pearl Harbor picked us up directly in front of the building as well which was great. The scenery was wonderful, and the fireworks looked good.The kitchen was also beautiful.If the bathroom shower was a hand shower, it was even better.I want to stay again! Thanks for a wonderful stay. The unit was great for my wife and I. The location is great, close to all amenities and the lagoon. Very nice updated condo. I have stayed at this facility before, but this is by far the best room. Nice view of the lagoon, and you get a free luau view every night at dinner! If I was to stay in Honolulu again I’d look for this room. Wonderful time. The condo has a perfect view and all the essentials you would need. Such a great place to stay! Very clean, organized, great rate and everything you need is waiting for you. I must say, I manage vacation rentals in Kona & would be more than happy to have a unit like this in our rental pool. Staying in unit #1530 was super quiet and very convenient while staying without a car this trip. I will definitely rent this condo again on my next visit.Thanks for going above & beyond in providing great service too. This was our 4th trip to Honolulu and this condo was the best experience we have encountered.Met or exceeded all our needs. Location is great; everything was spotless; more than adequate for our entire stay including some cooking; very family friendly and quiet; hopeful we can arrange to stay here next year. Condo was excellent. Had everything we needed. Newly renovated. Very clean. Good view of lagoon. Only down side was not many restaurants close by. Canoe's and the restaurant on the top floor are both gone. Only about a 20 minute walk to central Waikiki though. The location is fantastic. The unit itself is very well equipped, especially for a small family. Unreal value. Kristen's commitment to service is also very impressive. On our last day we were actually double booked with another client (very annoying but mistakes do happen). That said, Kristen worked tirelessly (on a Sunday) to ensure she found us a replacement unit close by. She responded very well. Thanks for the nice stay! We really enjoyed sitting on the lani watching the world go by!The condo was as advertised, and it was nice that the kitchen was well stocked! Also glad of al the extras you had for the beach!Now for the sad part... would have liked a heads up on the closed pool.... since it’s the only deep pool there with showers .and no access to shower off the sand from the beach. Also a heads up on the Ilikai’s on going contract dispute..as we woke up to picket lines one day..12 hours of chanting.. nothing to do with the condo section of the Ilikai as it’s the hotel employees that are without a contract, but a little info would have been helpful. Despite that a great time had by all!PS would have given you way more stars if you replace the mattress on the bed🙂Also very friendly staff at the hotel and valet service!! Thank you for your review. Whenever we are informed about any activities at the hotel, we do tell our guests about them. We did not know at the time that the pool was being renovation and just found out ourselves as well about the picket lines. The good news is that the second pool which is more for cooling off or sun bathing was still open. Another great option is the Hilton Lagoon which is right outside the hotel and great for swimming with calm and warmer waters. More great new I found out after speaking with the hotel personal, the picket lines were only for that one day and everything is resolved. This condo is a great option in a great location and we hope you can come again soon! Loved the condo. Good view of the lagoon and beach. Well equipt kitchen and anything you might need for the beach is provided. Roomy lanai. Walking distance to shopping mall. Quiet. Would definitely come back. Thanks for taking the time to post a review for the condo 1530 at the Ilikai Hotel. We are happy to hear you had all you needed and you enjoyed the views! We do hope you will return soon! Thank you so much for your wonderful review. We are happy to hear you enjoyed your stay. The condo is very accommodating and is centrally located. We do hope you can come again soon! First time staying here. Would definitely recommend it to my family and friends. Meet all our expectations. Like we were at home...all amenities...comfortable ....simple access (no key...hurrah). to get into condo....lanai view was good....plenty of sunshine until Noon....Location is ideal for easy walk to Mall and right on all bus line transportation. Thank you Doug and Jeannie for your wonderful comments about your stay in our condo in this review as well as your e-mail to us that I have copied here. Subject: Thanks Terry and Sue For allowing the rental of your condo. It was most enjoyable and Appreciated. We are so happy that you found the condo "most enjoyable and appreciated". We have tried very hard to furnish the condo with all the amenities to make our guests stays as comfortable and enjoyable as possible. It is so nice to hear that you felt like you were "at home" there. I know what you mean about "plenty of sunshine until noon". I so appreciate when the sun isn't too much for me so that I can sit out on the lanai to enjoy the view without worrying about sunburn or being too hot. Thank you again for your stay with us. Fabulous location, excellent accommodations! Very clean and filled with everything you can imagine. The "treasure chest" on the lanai has everything for a day at the beach.....a cooler bag to fill, back pack chairs, beach bags, boogie boards, snorkel gear and blow ups, they've really thought of everything! The kitchen has everything, pack a lunch using the Tupperware, take a beverage with the to go cups and when you return everything you need to cook a good meal is there! The condo is nice and cool, the furniture is comfy, it truly becomes your home while you are there. Way better than a hotel room! So close to the beach and all the Waikiki excitement.....I can't wait to return! The condo was a great spot to visit Waikiki. We watched the fireworks from the balcony on Friday night. Nice property. The apartment was exactly what was described and shown in the photos- reassuring. It was well- maintained and very functional for our family of 4 and used a small space cleverly. It had a very well stocked kitchen. The beach gear was brilliant, especially for children. What really makes this review 5 stars (apart from the location) is the professionalism of the hosts. Sue was a gracious and accommodating host. She went out of her way to assure our experience was perfect. Thank you again Sue! This is about our sixth trip to Waikiki and we always stay at the Ilikai, in Condo 1530, because of the great view, great location, and we personally love the great studio condo. It has everything we want to make an easy vacation for us. The owners are great to work with, and make the whole reservation process very easy. As usual, we plan to reserve our time there again next year! The room was very nice with all of the basic amenities. We appreciated the pack'n'play for our youngest and extra beach toys for the kids very much! We had a great view of the fireworks and the Hilton Village Lagoon. The location was perfect, only steps to the beach and easy access to everywhere on the bus. We had a great stay. Mahalo! Wonderful stay - everything you need! We just stayed with our 21 month old son for 11 days and had a wonderful stay. The condo is in a prime location, with the lagoon, fireworks and walking distances to many places, restaurants, shops, etc. Our view was also exceptional. The condo had everything we needed from a pack and play to beach tools, chairs and cooking utensils. We would reccomend that the condo have a thorough clean as behind the bed, and dresser were very dusty as well as under some furniture. We also wiped down the 2 vents , one in the kitchen and bathroom that a thick layer of visible dust. This is something that should be passed along to the cleaning staff. Other than that, we enjoyed our stay , would recommend it to others and would love to come back!Mahalo! Great condo, location and views! My husband and I stayed in this condo for a week recently and loved it! The views from the lanai were great, along with watching the luau across the street and fireworks from the lagoon. The location was perfect! It's a short walk to the beach, and the towels and beach chairs provided were great! The restaurant downstairs had great food and very friendly staff. There are a lot of restaurants within walking distance. The kitchen is fully stocked with all you need. Should we ever return to the area, I would most definitely stay there again. It took us until our last day to discover the fun shopping in the Hilton complex across the street and budget-friendly happy hour at the nearby Harbor Pub. The rental car facility is across the street, which makes it easy to rent a car for a day to tour. In addition, most other tours will pick up right at the Ilikai. It is really a great condo with great views, location and amenities. Wonderfully appointed, super clean condo in a perfect spot outside of the Waikiki madness. Great restaurants nearby and a short walk to duke's lagoon. The condo had extra little touches we all appreciated - like coffee filters, beach equipment and super fast wifi. The kitchen was perfect and all the relevant utensils were available. We couldn't have asked for better accomodation for our first visit to Hawaii. Thank you Sue and Terry. Your condo made our holiday complete! A very nicely appointed condo. The lanai was comfortably furnished too. Everything was up to date and convenient. Definitely, I would recommend this condo. Great hosts and great condo. Fantastic location and terrific building. Would def stay there again without a doubt. We recently stayed in this nice condo. It has a beautiful view of the ocean and beach. It's location was great, away from the huddle and bussel of shopping but still close enough to walk to when we wanted. Loved being close to the Hilton hotel as there's lots to check out there and only steps to the beach. Very well stocked condo with everything we needed. I miss sitting on the lanai and taking in the beauty. We would definitely stay here again. Owners were also quick to respond to any questions and were very pleasant to deal with. Great Location. Amazing views. Condo has everything you need to make it your own home.I recommend this condo to people of all ages. We stayed in condo 1530 in early November. The Condo is great, has everything you need. beach chairs, snorkels, etc are wonderful. View from Lanai is great. Would definitely stay there again. Loved this end of Waikiki - much quieter than down near International Marketplace. My daughter and I stayed here and we absolutely loved it! We spent a lot of time on the balcony watching the beach/water and the luau every night we were there. The use of the beach chairs, snorkel equipment and floaties was very much appreciated. All communication was quick and helpful. I would definitely stay there again! The room was great, although it lacked a few necessity in the kitchens but nothing we could not manage without. The pool closes early around 7 pm and while in the pool area while some were allowed to move chaise lounges around we were told no we could not. Additionally I felt like once the staff knew we were condo renters, they treated us differently. The bar area was very nice and staff was attentive. firework show was impressive but lasted only 4 minutes...overall I would probly return again to Hawaii just not sure the lack of amenities on site is worth it. We are so glad you thought "the room was great". I am surprised though that you thought that it lacked a few necessities in the kitchen. We try very hard to anticipate the needs of our guests and provide all the utensils, gadgets, cookware, bake ware, appliances and dishes that will be needed. We get many comments on how well equipped our kitchen is. Would you please let me know what you felt that you could have used to have made your stay better so that I can add it to our kitchen. The pool does close at 7:00PM. If you enjoy a later evening swim it is fun to go to the Duke Kahanamoku Lagoon right in front of the Ilikai. Most of the people at the Ilikai and around the pool are renting a condo. The staff is very friendly and helpful and should not be treating anyone differently. We just got all new pool furniture in June and the staff set it up to maximize the comfort, capacity and safety of the guests. The people who moved the chaise lounges were not following the rules. We are glad you enjoyed the bar and the staff. We agree with you that the fireworks are impressive. It is short but really nice to see them every Friday night. We really enjoy watching them right from out lanai but it is also nice to go down to watch. A really great viewing location is part way down the ramp to the Duke Kahanamoku Lagoon beach, which is where they shoot them off. We hope that you will return to Hawaii. When you do we would love to provide you with your accommodations again. We came into town to see The Cure at Neal Blaisdell Center and stayed at this condo for several days to enjoy Waikiki before heading inland for the show. We were tickled to discover that a luau with hula dancers and fire dancers was put on directly across from the balcony, so we sat in bliss for a half hour taking video and enjoying the show from the padded chairs on the balcony. We were also delighted to see that the condo had a vast supply of boogie boards, snorkel masks, inflatable rafts, and other water supplies. We swam in the Hilton lagoon every day, (so refreshing on a hot day), and snorkeled at the beach in warm water. Sylvester was approached by a sea turtle several times, but we were surprised that we didn't see much sea life besides that. I was so grateful for the inflatable raft because it sailed right over the area where I was worried there might be stingrays, (there weren't any that I saw, though). We were happy with everything in the condo and couldn't have had a better stay. We are so happy to hear that you "were happy with everything in the condo and couldn't have had a better stay". We are especially happy to hear that you used and appreciated the rafts and snorkel gear. That is one of my very favorite things to do when we are there. I actually lay on a boogie board and snorkel. How special that the turtle approached Sylvester. They are so incredible to snorkel with. I am sorry and surprised that you didn't see much other sea life. I snorkel right over the reef and float back and forth from the end of the jetty to the Hilton pier and see a tremendous number of fish. Next time be sure to crisscross back and forth across the reef. It is especially fun to just lie on the board with my face in the water and see what swims by. By the way, I have never seen a stingray there but that doesn't mean there couldn't be one. Hope to have you back. If you do come back, be sure to let me know before you book and I will write a promo code for you to get a "return guest discount". I am so glad to hear that you think the condo is "spacious" and a "great place." So glad you loved the beach chairs, etc. You did not make a mistake, there are two beds. The sofa is a queen size sleeper. My housekeeping team leaves the sheets, pillows, and blanket for it in the closet for guests who need two beds. I am so sorry that it wasn't more clear on our website. We look forward to providing you with your accommodations next time you come to Hawaii. Be sure to contact me before you book your reservation so that I can write you a PROMO CODE for a return guest discount. I booked this condo over a year ago, we have never been to Waikiki before. we flew with another couple who all so share their anniversary with us. the condo was beautiful, they had everything we needed and then some, very well kept up. the view was amazing!! we got Thursday and Friday fireworks. We stayed 4 nights with a total of 4 people. Loved to sit in the morning with a cup coffee on the lanai and watch the day start with people running and walking and surfing in front of you. Pretty quiet in spite of being in the middle of the hustle and bustle of Waikiki. Well equipped condo with everything you need. Mahalo! We stayed at this condo for a week in early March 2016. The place is very clean and kitchen had good selection of pots & pans and other stuff you need. I like that the flooring is all tile. Keeps it clean. View is beautiful. You can see the fireworks from your balcony. Lots of storage place. Also, has boogie boards, beach towels and beach chairs. Very good location to walk to many places or a short drive to mall. Only a small issue that the garbage disposal didn't work and when I called the number provided, I was told that she was aware of it and asked me not to use it. I just wish they had left a note saying not to use it or not to put anything in the sink. I wasn't a big deal as I discovered it early enough. We had a wonderful stay in condo 1530 for 6 nights. Traveling with an infant meant that we had more specific needs, which were adequately and satisfyingly met during our stay.Positives: great location (convenient for swimming, eating, and shopping), views, full kitchen, partition in the condo was useful so that we could still operate after baby was asleep on one side of the partition, box full of beach toys (including kids toys)Negatives: none except that upon entry the floors were very sticky. As if they had been vacuumed but not mopped. The instructions asked we remove our shoes in the condo however this was made difficult by the unclean floors. We had to mop the floor ourselves at the beginning of our stay otherwise it would've been unpleasant to stay there for the next 6 nights. We recently stayed in this condo as a mini pit stop on our way back from Orlando to home (29th-31st December 2015). We found the condo to be exactly as shown in pictures and words on this site. It was amazingly well equipped, clean and tidy, with added bonuses like beach and snorkel equipment. All information given to access the condo was accurate and helpful. The condo was in a great position, looking out over the lagoon and to the beach. We enjoyed sitting on the veranda and looking down on the nightly luau from the Hilton Hawaii. The owners communicated quickly in response to questions in the lead up to our stay. Thanks for the use of your condo! Great condo! The place was everything we were hoping for, and more. The view of the lagoon and ocean was great. Nice, clean and quiet at night time. We would stay there again.. This is our 2nd visit to this condo. We've stayed at several other condos in the Ilikai over the last few years. This is our favorite by far. Everything is perfect for us during our work/ play trips. The view is wonderful, the condo is clean, comfortable and well stocked. We will be returning again in October and would happily book this condo again! Great location and nicely renovated condo - tile floors, granite counter top, mirrors everywhere, and nice shoji decor. 1. The bed is really soft, and rolls to the middle - its probably very old and needs a new mattress. ( they said they bought it 4.5 years ago)2. The sheets are quite flimsy and there is only one set so we can't change them. (they said they will ask houskeeping to look into this)3. The upholstery on the couch and the chair are old and quite dirty. They do have a zipper, but i'm sure they haven't been washed for quite a while. (they will take care of this when they have time)4. The pillows on the couch are also quite dirty.5. it would be nice to have a player for ipod/iphone to listen to music. (bring mini jack to RCA cord so you can plug into the TV)6. a toaster oven would be a nice to have instead of having to use the big oven. if these items were fixed, and priced a little lower, i would recommend this unit. Thank you so much for your review. We are so glad that you thought the location was great and that the renovation was nicely done. We are also very pleased with the way it turned out with the tile floors throughout and the granite counter tops and mirrors and new cabinets. We are so sorry that the bed was too soft for you. As I told you, we bought a high quality bed with a "pillow top" from Macy's in November 2010, just 4 1/2 years ago. It was quite the ordeal to lay on all the different mattress choices trying to choose one that would meet the comfort of our guests. We realize we couldn't satisfy everyone since not everyone likes the same firmness of their mattress. But we have had several comments in our reviews about how comfortable the bed is and just a few, including your comment, that it was not comfortable. I hope that it didn't distract from your vacation. Thank you for pointing out the flimsy sheets. I 'm sorry about that. If you had told Valerie, our contact, when you noticed it, she would gladly have had the housekeeping team change the bed for you. We bought two new sets 5 months ago and I'm sure they could have remade the bed with sheets that you would have found more to your liking. Our housekeeping team cleans the room and makes the bed ready for your arrival. They don't leave extra sheets out for you but as I said, Valerie would have had the bed remade with a different set had you let her know that you were unhappy with the set on the bed. We make every effort to make our guests comfortable while they are in our condo. Thank you so much for pointing out that the couch and chair upholstery was dirty. The furniture is only 7 years old and the covers have been taken off and washed but they must be washed and not put in the dryer because they will shrink and not fit back on. We must do that when we don't have back to back reservations so that we don't inconvenience any of our guests. Housekeeping will be washing them again as soon as we have an opening in the calendar. Unfortunately, right after they are washed they could need it again because all it takes is one guests with suntan lotion on who sits on the couch or chair to cause it to get greasy and attract the dirt again. You don't need a player to listen to your music on your ipod . One of our guests wrote in his review. "we found that having a HD TV with a VGa connection we could use our small notebook computer with the TV. We could also plug in our i-Pod to the TV and play music through the TV speakers". Thank you for the suggestion of the toaster oven. We haven't had any other guests mention one. We will consider adding one. We appreciate your reservation and look forward to providing you with your accommodations the next time you visit Hawaii. Be sure and contact us before you make a future reservation so that we can give you a return guest discount code. Unit 1530 was our home away from home! This was our first trip to Hawaii and I searched carefully for the perfect condo. Unit 1530 was pretty close to perfect. It has been recently renovated, so it was beautiful inside. The furnishings were a little dated, but I think it gave the room character and everyrhing was very comfortable. The room was large enough for 4 of us. It was equipped with everything you could possibly need. I liked the fact I didn't have to rush out to buy toilet paper or paper towels- as a family I met in the elevator had to do ! Walking distance to many restaurants and stores. Great view of lagoon and fireworks and luau next door. (Glad I didn't pay for that luau! It looked cheesy compared to old Lahaina luau in Maui! ) Only complaint I had was it was a long walk to the beach. If you had small children or elderly it could be a challenge. Especially with all your beach toys. My teenagers lived the beach though! Parking-,we parked above red lobster for $20 a day with in and out privileges. Saved a little bit of money. We rented through VRBO without any problems. Greats vacation! This was the best condo. Having stayed at others, this was the best outfitted and the nicest of all at the Ilikai. The kitchen was laid out well, and had better utensils, etc, than we have at home. Look forward to staying again. We recently returned from our stay at the Ilikai. We normally stay with family when visiting Honolulu but decided to stay closer to the beach this time and the location couldn’t be better. It was a 5 minute walk to the lagoon and beach and there is a great selection of restaurants to dine at. Overlooking the pool, lagoon and beach, the view was amazing! The condo was just as described, a fully stocked kitchen and everything we needed for beach activities was there. The condo was a bit tight for our family of 4. Mind you, we were travelling with two young kids, one of whom is a toddler so you can’t travel light! With the sofa bed out, a crib AND a stroller, there was little room left. The king bed was a bit too soft for us and the pull out couch squeaked and shifted a lot when some one got in or out of the bed. The owners were a pleasure to deal with! They helped us out with baby rentals and answered all our questions right away. The glass table top broke and the staff was in that day to remove it and resolve the problem right away. We just spent 30 glorious days in Honolulu staying in Sue and Terry's condo. We have been to Hawaii on a number of other occasions, usually staying in Kailua, a quaint quiet town on the east side of the island. This time we stayed in Sue and Terry's condo on the outskirts of Honolulu, which we found to be 5 star compared to other accommodations we have experienced at the Ilikai. They just remodeled the condo last fall (2014), and we thoroughly enjoyed the felling of home while we were staying there. There was no lack of kitchen items to prepare meals at "home" rather than eating out every day. Facing the Hilton Hawaiian Village we were privy to the fireworks every Friday night right from our lanai. The Hilton luau was also directly outside of the condo,so there was no lack of free entertainment. We loved the condo and would be thrilled to stay there again, and to recommend dealing with Sue and Terry. Perfect weather...perfect accommodations make the vacation incredible! Mahalo nui loa! This condo worked out great for us. My girls loved sitting out on the lanai each morning with their breakfast. The view over the lagoon out to the ocean was great, especially when it was time for the fireworks. It was great having access to beach towels, a cooler and all kinds of beach gear. It made our stay less stressful not having to worry about how we would keep the girls busy while we were at the beach. The only negative thing I have to say about the condo is the stale, musty smell. I'm not sure if the air conditioner needs a new filter or if the rugs need to be shampooed, but there is definitely an odor that needs a bit of attention. Aloha and Mahalo for your review. We are happy to hear you enjoyed your stay with us. We found that the air conditioner was malfunctioning and currently have a new one on order to take care of any mustiness. The Ilikai Hotel is a wonderful home away from home and we do everything we can to ensure our guests have a great time. We hope you can stay with us again soon. Nice but could use some updating!! I have stayed at the ilikai in the past. The location is great. The view from the lanai was great. The room was chosen for a quick two night stay for 4 adults so did the job. But the pull out couch was not too comfy and some things could be updated. We had less than a half roll of toilet paper. So needed to purchase . I had no idea... There were some chairs for beach use but we did not need them. Probably a good place for only two people and not expecting too much, except maybe a great view and location. Thank you to all of our guests for your continued feedback. We just stayed 2 weeks in Condo 1530 and had a wonderful, relaxing time! You can't beat the spectacular view, the fun atmosphere of the location, and the handy shopping nearby. The condo is self sufficient with everything you need. If you need anything specific, someone will help you with one phone call. We especially like the folding doors that separates the couch area from the bedroom, since my husband and I go to bed at different times. I haven't seen that in any other condo. Thanks again for another enjoyable stay in your condo. We are so glad that you thought our condo was "great". We hope that you will be able to come back again. You will see that it is even better. We just completed a total remodel putting in new kitchen and bathroom cabinets with granite counter tops, new appliances including a dishwasher, and tile floors throughout including the shower. We are so pleased with the way it turned out. We will be happy to give you a 10% return guest discount on the regular nightly rate. Loved our visit to Hawaii and the accomondations provided by aloha Condos #1530. It provided everything that we needed. Great view of the lagoon and ocean and surfers. Plus got to enjoy a leau every night from the roof top of the conference center next door. The king size bed and pull out on the couch were very comfortable. Everyone slept very well. Easy to check in and out made travel enjoyable. My recent stay at the condo was very pleasant. The information the owner sent were very thorough. It saved us a lot of money to park. The hotel was very conveniently located. The room was nice and comfy. It was not a large room but it was perfect for us. We loved the fact that the owner has everything from beach chair to cooler. The view was not direct ocean view but we were only ten steps from the actual ocean. The hotel staff were extremely helpful, kudo to the man, who while doing his job sweeping the steps in front of the hotel, noticed that I was struggling carrying my luggage down the steps, walk over to help even though it was not his job. Loved the place and will definitely stay at the same hotel and rent from the same owner again. This was the second time we chose 1530 for our Hawaii vacation. Everything was perfect the same as the first time we stayed there last year. We had an early check-in as our flight arrived early in the morning flying in from Tokyo overnight so we crashed and had a quiet snooze before going out later in the afternoon and evening to a nearby grocery store and shopping mall. The unit is quiet and peaceful. We spent a great deal of time in the condo as the weather didn't cooperate completely the second week but we found that having a HD TV with a VGa connection we could use our small notebook computer with the TV. We could also plug in our i-Pod to the TV and play music through the TV speakers. Also there were several books there that we could read. So, who needs surf and sand? Good food, good drink and a good time. What more can you ask for? We had an excellent stay in this condo, everything was so perfect, location,view,easy check in, comfort. I was a little bit hesitate to book a condo, it was my first time in america (french) and we are not used to this practical. But the owner made everything easy. And now i won't hesitate to do it again. Great break from alaskan cold! We had a super stay at Ilikai Hotel Condo 1530. Everything we needed was there...sand toys, water toys, beach necessities, plus all the kitchen goods. This was the perfect place for our family. Easy access. The pool is primarily full of people over age 55 so we did feel uncomfortable at times with our 4 year old in there. The pool is just a pool, but warm and the chairs/provided towels are great. The Friday night fireworks were cool. We could also see the luau at the Hawaiian Hilton Village from the lanai which was also cool. Loved our 5 night stay here at the condo. The view and location were great and the apartment had everything we needed. Good views from balcony. Comfortable and quiet. Key pad entry much better than worrying about a key, especially if you are going to the beach. Good beach access. Loved it there! Has everything you need && more. You can see the luau from the balcony && it's a perfect view of the firework show every Friday night. When we return to Hawaii, we will definitely stay at the ilikai again! Sue was a pleasure to work with. This amazing condo made our stay even better than we could imagine, and saved us tons of money! They had everything that you would ever need to have an amazing vacation. All the swimming stuff, masks and snorkels, beach towels, swimming floats, and boogie boards. It had every apliance you would need that made the kitchen feel like home! You defiantly get your money's worth with this condo! The furniture made it like you were still outside enjoying Hawaii! This condo put our honeymoon over the top. Definitely a 10/10!!! We were delighted with the apartment. It has been tastefully and comfortably furnished; and is fully equipped with everything we could possibly need.The large box, full of beach equipment, is such an unusual, but thoughtful, touch. At our age (mid-80s) we did not use much, but other renters will appreciate that extra service. Overall, we had a delightful stay. Could watch the hulu show across the road if we wanted to; and fortunately it ended early in the evening, so was not a nuisance. Also, a first=class view of the Friday evening fireworks on the beach. This is our 4th year staying in condo 1530 and we love it! The view from the lanai is wonderful of the ocean and all the activities on the lagoon, the Friday night fireworks on the beach, and the luai on the roof of the Hilton. The studio is perfect for us with the nice kitchen, and amenities, and we love having the folding doos to separate the bedroom. It is always clean, bright and cheerful. We love the new patio furniture and rug. The owners are wonderful to work with and very accomodating. My wife and I thoroughly enjoyed our stay at Ilikai Hotel Condo 1530. We've been married for 45 years and it was like a second honeymoon! The condo is perfectly located close to whatever shopping you want to do. No rental car is necessary as you can easily walk to the two larger supermarkets in the area. Plus, if you need transportation, The Bus stop is right outside the main door of the hotel. The room was quite clean, everything that we needed to prepare our meals was there. We hope that we can stay there again next year. We moved from another condo within the Ilikai and were very happy to find it was ready for us to move in from 1100 instead of 1500. This made a very smooth transition for us. The bed was extra comfy and everything you needed was provided. The location was very central to restaurants, bars etc & within walking distance to ala Moana Shopping Centre. Ilikai #1530 is a great place to stay. Clean, comfortable, well decorated and equiped with everything we needed for a great stay (including a blender for drinks). The lanai furniture is very comfortable and the views of the ocean and saltwater pond are good as well. Sue was very easy to work with and everything was seemless. This isn't the middle of Waikiki but close enough and plenty close to lots of restaurants and shopping. We would stay there again. My husband and I had a wonderful time at the Ilikai and Room 1530 was more than what we expected. We had all the comforts of home and a lovely balcony to have our meals or share a drink and view the beach and lagoon and all the activites through out the day. You are lucky enough to see the fire works from the balcony on a Friday night also. Only negative, please update the loungeroom furniture as my husband took the couch and I was left with a very uncomfortable chair to try and sit on!! We will definatley be coming back, infact planning another trip already!! The quality of accommodation was not to our expectation - no bath tub, which we like, poor quality of bed linens, pillows, kitchen crockery and cutlery. Uncomfortable and poor quality of room furniture but it was better than staying hotel. I used to stay at Ilikai during 1980s so I know the place. I suggest there should be a rice cooker and some Japanese dishes to be placed in the kitchen. We are so glad you enjoyed the view from our condo. We appreciate your comment in your extended review "Most likely, I would recommend this accommodation to my best friend!" We wish, however, that you had let us know of the things that did not meet your expectations. We have a local contact who is available most any time who could have addressed most of your needs. We have multiple good quality king size sheet sets and extra pillows of varying firmness. If our contact had known you were unhappy with those items they could have provided you with other choices. They also could have shown you our 10 cup rice cooker and a large selection of good bake ware and cookware. After your check out and review, housekeeping checked and found that the rice cooker was there. We keep it in the cabinet under the eating bar with all the cookware. I'm so sorry you did not find it. Thank you for your comment on the cutlery. We will check into getting a new set the next time we are at our condo. We are sorry and surprised that you expected a bath tub as the Ilikai condos do not have bathtubs in them. They were built with showers only. I believe there may be a few that the owners put a bath tub in many years ago but they are no longer allowed. The Ilikai is quite an icon in Waikiki. It was the very first Condo-Hotel concept in the country. We had our furniture made for us 5 years ago choosing that style to preserve the original tropical feel of The Ilikai and Old Hawaii. We are sorry that you didn't care for it. Mahalo again for your review. We hope that we will have the opportunity to have you, and or, your friends as our guests again soon. Spend 5 lovely days in this condo, everything was good and we have everything that we need. Management of condo very helpful, we had some questions, and they were immediately solved. Ilikai hotel has really convenient location -beach, Alamona shopping center all around, we love so much, will be back soon. Sue and Terry were wonderful to work with; very nice people, and are quick to respond to any questions or concerns. The hotel staff is friendly and knowledgeable. 1530 is comfortable and has a wonderful view. Although I only used a boogie board from the beach amenities provided, it was nice to know they were there if we needed them. My husband and son went on four dives while they we were there and had brought (most) their own gear. The only constructive criticism I have is the cushions to the couches are in desperate need of cleaning, the carpet could use a cleaning as well, and the bottom sheet to the pull-out have a few small holes. The beds were very comfortable, and loved the pillows. We would definitely recommend this condo, and would rent it again.Sue and Terry, thank you for lending us your home, away from home. Thank you so much for your review. You are very welcome! We are so happy that you enjoyed your vacation in our "home away from home". We really appreciate your comments on the couches needing cleaning and want you to know that we did clean them after reading your review. Thank you for letting us know they needed cleaning. We have many guests visit our condo between our personal visits and we don't know the needs until we go for our own visit or our guests tell us like you did. We also have purchased some new sheets for the sofa sleeper. Unfortunately holes in the bottom sheet are a continual problem because the mechanism that closes the sofa sleeper up catches the sheets in the hinges and puts holes in them. We have had brand new sheets get holes the very first time they were used. I'm also sorry the carpet was not clean for you. That is also a problem we have because we so often have a guest moving in the very day a different guest moves out. There is only a 4 hour window between check out and check in for our housekeeping staff to get the condo ready for the next guest. When they discover the carpet needs cleaning they schedule it but we prefer to have them cleaned when we have an opening between guests so that we don't bother the guests during their stay. If however, a guest would want the carpet cleaned during their stay they could request that our contact manager schedule a carpet cleaner. We are so happy that your would rent our condo again and we look forward to it. The management company were very quick to react to our complaint about the herd of elephants living in the unit above us. The apt. was clean, well equipped, a good comfortable bed, and in a great location. The front row seats for the friday night fireworks display was spectacular. The only negative was that the living room furniture is very dated, the same type of uncomfortable Hawaiian rattan furniture used in the Ilikai 25 years ago. The condo was very clean and had everthing we needed. It is exactly like the pictures. I loved the balcony. The free internet and free calls to Canada were an added touch. Sue and Terry were easy to work with and I would recommend this condo to anyone. All the information that we needed was provided to us via e-mail. The condo was perfect for the 3 of us. The location was great, very short walk to the beach, walking distance to the main strip and to a large shopping mall. Easy access to the bus. We would definitely rent this place again. Very convenient. Close to beach, close to store, close to restaurants, close to bus stop. Comfortable and accomodating. Our kids especially enjoyed the boogie boards! Would definitely stay again. This place was great! It was easy to book online and pay, easy to check in (a keycode on the door so you didn't have to wait on anybody!) and very well put together. The view was awesome and we loved the location, it was a short walk to the ala Moana and Waikiki. The condo had everything we needed, bath and beach towels, kitchen items. The furniture and fixtures were outdated, but for the price it was fine. We had a very pleasant experience. The condo was clean, the location and view were great; this was a perfect fit for us. 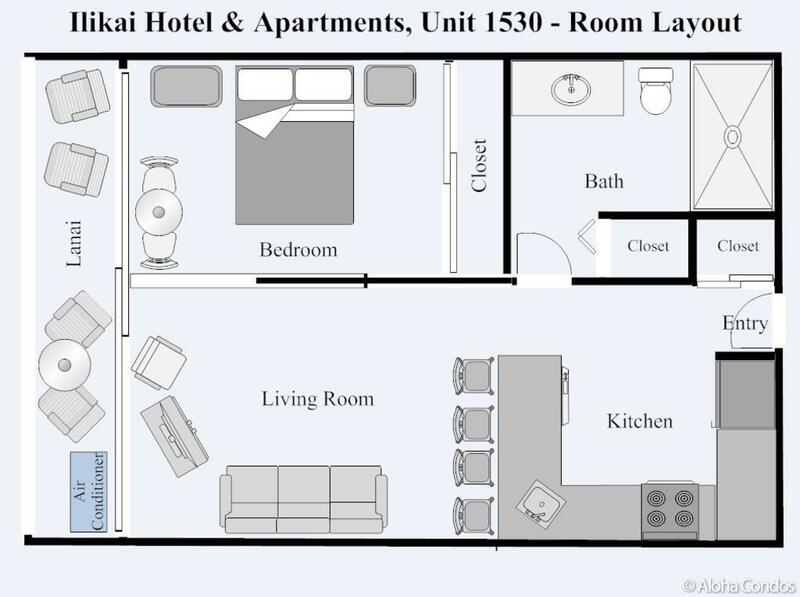 We stayed in apartment 1530 with our 8 month old baby on our first visit to Oahu. The apartment was a good size for the 3 of us, although we had to be very quiet when the baby was asleep and we were still awake. Overall the apartment was very quiet, there was no noise from neighbouring apartments and it was safe for our little one. Facilities were good, a big fridge, big bed, cooker, TV and air con. There was only a shower, no bath, which led to us bathing the baby in the washing up bowl, but it was big enough to do that. Great location right next to a bus stop, the start of the beach and there were supermarkets within easy walking distance. I would recommend this apartment. Sue was great to work with, from the moment I requested information about the condo well after I left. Her responses to my questions were extremely timely and informative. I was skeptical at first, but had no troubles with the transaction. When I arrived at the Ilikai I was greeted by friendly staff. The condo was very clean and spacious. Everything I needed was right in the room and easy to find. The location was superb, close enough to the main Waikiki strip to make it easy to get to, yet not so close that I could not relax and enjoy some peace and quiet. The morning view was fantastic and the beach was a mere few minute walk away. An easy walk to the mall, plenty of places nearby to eat (Red Lobster, Kobe Steak House, and Buffalo Wild-wings were my favorites). The only thing that could have made it better would be to convert the room across the hall to an observation room so you could view the sunset! Excellent view of the fireworks across the lagoon on Friday night! I would highly recommend this condo to anyone who is considering it! The condo is well looked after and very clean. We loved the location - less than 10 minutes walk to ala Moana Shopping Centre and the main Waikiki strip/restaurants. Trolley and bus stops right outside the door. Great pool for the kids and the lagoon and beach are very close by. Lots of fun toys for them to take to the beach. King bed extremely comfortable. Ample storage. Kitchen well equipped. Great to have use of wireless internet and free local calls. We were treated to a hula show on the roof of the hotel next door almost everynight as well which was great! The only challenge for us was that our children are young and easily woken so once they were in bed we needed to be very quiet and minimise the lighting as there was only a thin sliding door between the bedroom and the rest of the apartment. The apartment isn't newly renovated but this doesn't matter. It is light and bright and has everything you need. Nice view of the water off to the right. A great way to wake up each day! Great to have the kitchen facilities particularly with children. Our preferred grocery shop was The Pantry about 10 mins walk away. Fresh food and salads and some brands from home. We also tried Foodland (a small Woolies or IGa in Oz) but didn't think it was as good. Don Quiyote is also meant to be great but we didn't manage to get there. We would stay in the apartment again if it was the two of us. A great affordable option with all the added features you don't get in a hotel room. Lastly the owners were lovely and great to deal with - they responded to questions very quickly and provided lots of good advice. Thank you Sue and Terry for a great holiday! We loved it. Everything is avaliable in apartment to make the stay comfortable. There has been thought put into the apartment. eg coffee grinder ,smoothie maker.,scissors. snorkalling gear. Excellent location able to walk to all stores,and cafes. and beach,lagoon and marina. great pool area .friendly valet and informative doorman . change machine for coins downstairs.even shops for milk wine stamps and postcards in building. beautiful views from balcony.good apartment access no need for key or card.very clean and relaxing place to stay . The condo had everything we needed for our stay and was comfortable. The bathroom could use some updating but was clean for our use. We enjoyed this well-furnished condo. Minor problems were:no stopper in bathroom sink, exterior sliding doors don't lock, carpet had stains near dining table, and too much owner gear in closet. Thank you for your review. We are so glad that you enjoyed our condo and that you wrote in the extended review, "Absolutely, I would recommend this accommodation to my best friend!". We hope that we will be able to provide your accommodations for your next trip to Hawaii. We are sorry that you had some minor problems. We were not aware that the bathroom sink stopper was missing. We will get a new one. The exterior sliding door does lock but it is a bit tricky. Thank you for pointing that out. We will put "locking" instructions on the door. We are sorry that you found a stain on the carpet. We have our carpets cleaned regularly and additionally whenever there is an obvious spot after a guest departs. Since check out time is 11:00am and check in is 3:00pm. our housekeepers only have 4 hours to get the room ready for the next guest when we have back to back reservations. If we need the carpets cleaned we need to have the room vacant so that we can get the carpet cleaners in. There were 3 back to back rentals in a row before your arrival and three after you. We will be having the carpets cleaned again as soon as we can do it without disturbing our guests. The items in the closet are for the convenience and use of our guests. They are not our personal gear. After a day long of travel we reached the 15th floor with our secrect code to get in. (we were 15 minutes early) When we heard the lock click and open it was relief heaven. We proceeded into the most perfect condo we could imagine. Everything and anything was ther for us. Mask, and snorkel, beach chairs, boogie boards, you name it. The view was and is incredilble. The agnews, who you deal with are superb. I would recommend them without hestitation. Have no fear having the privledge of renting their condo. The condo is in a great location and pleasant environment. I enjoined our recent stay at Ilikai condo. Nice location, close to the beach, condo was clean and roomy. Ilikai Condo 1530 was the perfect "home away from home." The convenient location, complete beach supplies, and comfortable setup made every day a delightful experience. The balcony with it's view of the water, sunsets, Fri night fireworks, and even the hula shows next door were the icing on the cake. With aBC stores close in both directions and a grocery store within a few blocks, all necessities were easily handled. I'd recommend the bus pass (available at the aBC store) for ease of transit around Honolulu without needing to pay extra for parking. The keyless entry and check-in/out procedures could not have been easier, and the pre-trip contact with the owners thoughtful. I absolutely plan to return again! enjoyed the condo very much and found it more than adequate for our needs. location was great for us - close to the beach and restaurants. I would stay there again. The condo was a bit small for more than 2 people, there is not allot of storage or drawers to put clothes in. The closet was average with a few shelfs. the queen size bed was OK (not to hard or soft). Kitchen and living room were tight but very nice and well furnished. They even had snorkels, body boards,beach chairs and a portable cooler for the beach. Very clean and well maintained. Sliding doors separate the living from the bedroom for privacy, very large balcony. Very comfortable room for family of 3. Had everything we need and then some. Special plus with the beach chairs. The beach access was a hike to get around the lagoon but we considered the walk as bonus exercise. Would love to have had access privileges to the fitness room but that was restricted to hotel guests only. For the price, the view, and short walk to the beach, this place was hands-down best deal in Waikiki. We just stayed for 2 weeks in beautiful Wakiki in Room 1530 at the Ilikai Hotel. We've been coming there for the past 6 years but this is the first time we've stayed in Room 1530. It has a fabulous view of the lagoon and ocean, is right next door to the beautiful Hilton Village, is across the street from 3 well-known restaurants, is 2 blocks from the biggest outdoor shopping mall, and 3 blocks from a large movie theater, and bus service is right in front of the hotel. The condo is clean, has a nice, well equipped kitchen, 4 bar stools, couch, chair, and flat-screen TV. The screen between the bedroom and living area is very nice and convenient. It has all the necessities of home. It was nice and easy to have a "code" for the door rather than having to use a card all the time. The only negative thing I could say was that maybe the TV could have had more channels than the basic ones, but we are used to 200 at home! The Ilikai is also a bus ride away from downtown Wakiki where there are great restaurants, hotels, great shops, and an international market. What a WONDERFUL place this is to forget your troubles and enjoy life to the fullest! This is a very convenient location and a very clean and comfortable apartment. Easy walking distance to everything, and the beach, too, of course. The hotel pool was nice. The only drawback for me was the one time $125 cleaning/service fee, since I only stayed for 3 days.... If you're staying for longer periods of time, then it wouldn't be much of an impact to the daily rate. Overall, great place to stay. The owners of this unit are extremely nice. Loved my vacation! We really enjoyed our stay in this condo. Everything seemed very clean. The kitchen was well stocked,had everything we needed,and the view from the balcony was beautiful. The only thing we had an issue with was the sofa sleeper. We just had a tough time getting it to fold back up. Other than that everything was great. We used the valet parking at the hotel and were charged $18 a day. The unit is so clean-i wore white socks around and they STAYED white!! I can't find a hotel room where that happens. We had the feeling of our own little secret get a way nook. The wall of windows allow for great people watching and your view of the ocean is great. We saw the Hilton luau each night with ease and were close enough to hear the music and the story line!The owners provide everything you could possibly want or need during stay in the condo. The building itself is beautiful and i never felt unsafe once. The staff is always visible and making improvements. There is also security in the lobby if needed.The location is great and you can walk in either direction out the front door and find reasonable food, entertainment, and necessities.I would recommend that you find a trolley schedule/guide upon arrival as they pass by the hotel every 10 minutes and can make getting to other locations much more fun and interesting as well as allowing for a unique tour experience!Pack your sunscreen and expect the rest to be handled in 1530! WE WILL BE BACK!!!!!!!!!! We stayed in this condo for 8 days and I would definitely recommend it. It is small, but great for 2 people or possibly a third. I wouldn't put 2 couples in it. The fold-out bed was uncomfortable and lumpy, but I understand a new egg-crate mattress has been ordered. The kitchen works good and there is a good lanai. If it was mine, I would get rid of some of the extra pillows and flowers, etc. It is small enough that they just get in the way. Although there is an assortment of beachchair type things, they are all heavy and bulky enough to discourage anyone from taking them to the beach a second time. However, these are very minor annoyances and I would definitely stay there again. This is such a conveient condo to the Waikiki area without being in the crowd. The unit was clean and well furnished but could use some updating especially in the bathroom. The view from the balcony was beautiful. Parking was an extra $18 per day but that is not bad for the area. Very easy walk to the beach and ala moana shopping center. We loved the unit. Best value on the beach. Right next to the Hilton Hawaiian Village. Can watch the luau's from the balcony. Building was older, but nice, clean and functional. We hope to go again.The .25/hour parking lot in back worked great.